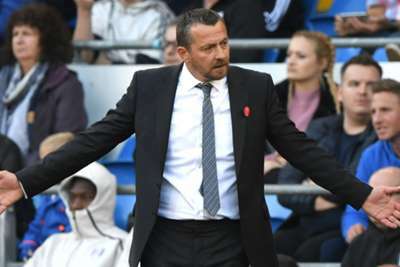 Fulham boss Slavisa Jokanovic knows his side have to improve defensively after they again struggled badly at the back in a 4-2 defeat at Cardiff City. The Cottagers dropped into the Premier League's bottom three as a result of Saturday's loss and have now conceded 25 goals in nine matches, six more than any other team. "We have so many problems in the defensive side but we have to find a solution," Jokanovic told BBC Sport. "It's still early on in the competition; we can find improvement, we must be brave and keep going to fix our mistakes. "They scored easy goals, even when we defended in numbers they finished the action and scored. We weren't strong enough in our box." Andre Schurrle put Fulham ahead with a superb opener, but Josh Murphy was afforded acres of space to restore parity. Tim Ream's error then enabled Bobby Reid to slot home, and although Fulham responded through Ryan Sessegnon, Callum Paterson and Kadeem Harris secured Cardiff's first win of the season. Having seen his side double their goal tally for the campaign, Cardiff manager Neil Warnock insisted the Bluebirds will build on the victory. "It's just a great feeling for everyone at the club," Warnock said. "We have been playing well the last few weeks and not had the rub of the green. We persevered and they didn't let the disappointments get them down. "We are made of stern stuff, the fans are unbelievable as well. In the second half we rolled our sleeves up and said, 'this is our season'. "We wanted to have a go at them and we did. Everyone worked to the plan and on another day we could have got more, but I can't be too greedy."